AI driven expertise & profiling: hype, hope or déjà vu? May was a busy month. Apart from helping establish then launch a real estate and mortgage business (Bees Homes) I was in Lisboa for Social Now and London for KM Legal UK. 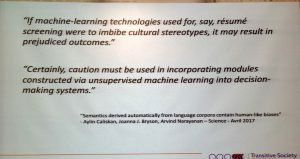 I attended both in the expectation of learning more about the onrush of Artificial Intelligence and its implications for the Knowledge Management profession. Specifically, I wanted to see how the encouragingly styled Talent and Knowledge Matching / Profiling systems might tackle the challenges of knowledge loss when people depart, of onboarding when people arrive and identifying / ranking expertise that might otherwise be opaque when pulling together teams. It’s not a new topic: back in the late 90’s I was Business & Strategy Advisor to Sopheon PLC when we acquired Organik (a technology for identifying expertise) and built systems for US Insurers looking to establish the best teams for clients based upon expertise. We never cracked it even though we knew what the issues were (usually motivation)! 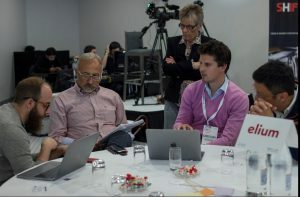 Seeking answers at SocialNow Lisboa while Keynote speaker Ellen Trude watches. 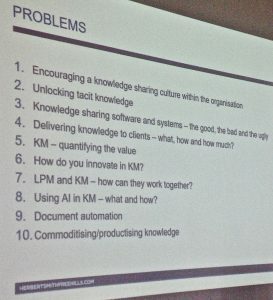 Armed with a list of ‘use cases’ I’d worked on with Martin White I set off in search of answers to these questions from both vendors and KM practitioners? Onboarding: A new employee with many years of highly relevant experience joins the firm. How long will it be before their experience is ranked at the same level as their predecessors? Functionality: Do they offer the ability to present a list of people ranked by expertise? Language: In multinational companies where it is especially difficult to know all the experts, how does the vendor coppe with the fact that documents, meetings and social media traffic will be in local languages? Testing: What User Testing is undertaken with a client before signing a contract to verify that the profiling system works? Embrace or die? 88% of technologies already include AI. it’s not Enterprise Social Networks (ESN)! On the surface the case for ESN is compelling. Yet the majority of vendors at SocialNow focus on information exchange and conversation rather than the capturing and cataloguing of it. One,@mangoappsinc, had a neat tool (they won the “coolest app” prize) with the ability to upgrade comments from threaded discussions and posts to create ranked knowledge resources from the mass of information and conversation. So, ESN can show who has answered what question, conduct searches across conversations and in many cases act as a project management tool, the new Facebook at Work (Workplace) now allows the creation of documents for example. ‘Questions’ is the key to find experts as people don’t keep profiles updated. So onto London and KM Legal UK. An interesting Day One ended with a psuedo Peer Assist in which AI was raised a lot. Again, as in previous years I felt the focus was on operational tools and techniques which means that KIM Professionals in Legal are more at risk from the onrush of technology. It reminded me of the issue Librarians faced with the arrival of end user search in the mid 90’s which finished their monopoly of being the people who found stuff in organisations. Day Two took a deeper dive into technology and its potential impact. 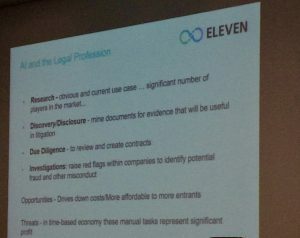 This slide sets out where AI is making a difference in Legal. As yet no one had focused on expertise and profiling so when one presenter cited the case where a newly arrived CEO asked the Head of HR / Talent Management to let him have profiles / competencies of the staff using their system it got my attention. I asked whether the results the HR head gave the CEO inferred a level of expertise. It didn’t which got thinking that if the data set is incomplete and the issue of self reinforcing bias is not addressed then over reliance on one source for identifying ‘experts’ is dangerous. Imagine your career prospects if for whatever reason your name wasn’t on the ‘expert’ list given to the CEO? So where do I see the state of expertise and profiling systems? Patchy! Yes there are certainly companies who ‘get it’ but can they do it? The most important lesson learned is the need for an expertise location strategy that is linked into HR processes, knowledge management, training, job appraisals and social media development. Finding people with expertise is not a ‘search problem’. Good search tools can certainly help but without attention being paid to profile quality (even if other types of content are being searched) and a commitment by employees to share their knowledge expertise discovery will not be as successful as anticipated or required. In any event you cannot capture everything people know; we learn and share through stories (failures rather than successes) and those often remain hidden. Whether Lisboa, London or Tehran the pace of change is gathering apace with increased pressure for improved performance, greater efficiency and reduced risk. Over the last couple of months I have been working in all three of the above capitals. It has been a priviledge and an eye opener: Iran is eagerly awaiting ratification of the Geneva deal and Tehran is awash with foreign companies looking to position themselves post sanctions; in Lisboa they are feeling the effects of a ‘drawn’ election and in unchartered territory over the formation of a new government and whether to continue with a programme of austerity and; in London there is considerable angst about the impact of cheap Chinese steel on an already depressed commodity market and on local communities. 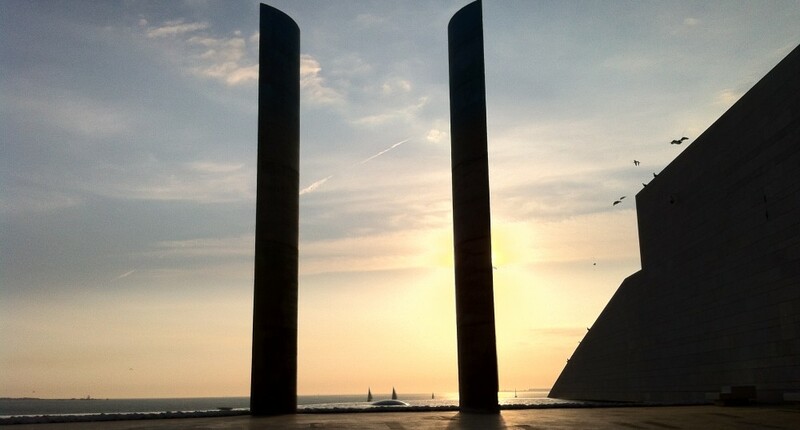 In Lisboa, many young innovative Knowledge Workers have felt the full force of the austerity programme and fled the country rather than face an uncertain future while the cadre of secure middle managers hang onto their jobs. In London, consolidation (especially in the legal sector) is growing and the push to outsource a core part of the UK Government’s drive to reduce the role of the state. Further afield UK Manufacturing continues to be battered by cheaper cost centre imports with inevitable plant closures. In Tehran, as they face an openiing up of their market place and an influx of of overseas competition, local knowledge is becoming much in demand and creating a sense of eager anticipation in a workforce that has traditionally sought overseas postings as a way of enhancing their knowledge and careers. The role of the informed knowledge worker is going to become more critical and they will need to move up the value chain in order to do so! These are service innovation, based on a full understanding of the customer and their needs; value in authenticity, based on on a full understanding of cultural context; resource innovation, based on a full understanding of material flows; and rich knowledge, based on a full understanding of the technical knowledge held inside the organisation and a method to capture and codify it. High value businesses combine these; for example, mastery of resource innovation often creates new technical capabilities that lead to new forms of rich knowledge. Finland is a great example of a country that is highly technological, expensive with a great education system. That it commissioned the work is unsurprising and the findings underpin the growing realisation across many organisations that people matter, are transient in nature and that processes need to be in place to recognise that. The future role of the Knowledge Worker? While to many this may seem axiomatic it is indicative of the shifting thinking around the way organisations manage and nurture today’s and tomorrow’s Knowledge Workers. On Monday I was at Chiswick for the first meeting of the reconstituted BSI KM Standards Committee established to provide inter alia the UK’s input into the global ISO debate on the need for standards for Knowledge Management. While hugely encouraging that KM is now being more formally recognised it was instructive to see how slowly the wheel of change turns. I have asked him to write a guest blog to reflect on some of the knowledge capture techniques we used. Watch this space! A big difference between us and them is that Europe always has a succession plan. McGinley was surrounded by past captains and future captains, and they all reap the benefits. We’re lone rangers as far as captains go. Nobody knows what we’ve done in the past. There’s zero collaboration or institutional knowledge. Why is the outcome of a biennial golf match of interest to lawyers and others who work in highly rewarded and individualistic roles? Because the players are all ‘Rock Stars’ in their own right who come together sporadically to play (and win) against their peer group. What stands out about the European approach? Meticulous planning, attention to detail, clarity over roles before, during and after each Ryder Cup match and a willingness to acknowledge that no one player is bigger than the team. Business is no different relying on a collaborative team approach and a set of shared values. Some time ago I was the Business & Strategy Advisor to an Anglo-Dutch company in the professional services / software business. It was around the dotcom boom period when investors were falling over themselves to back the next hot opportunity. Company valuations were bizarre: at one point on revenues of $20m we had a market cap that was 40 times bigger. Our AIM share price went from £1.25 to £16+. 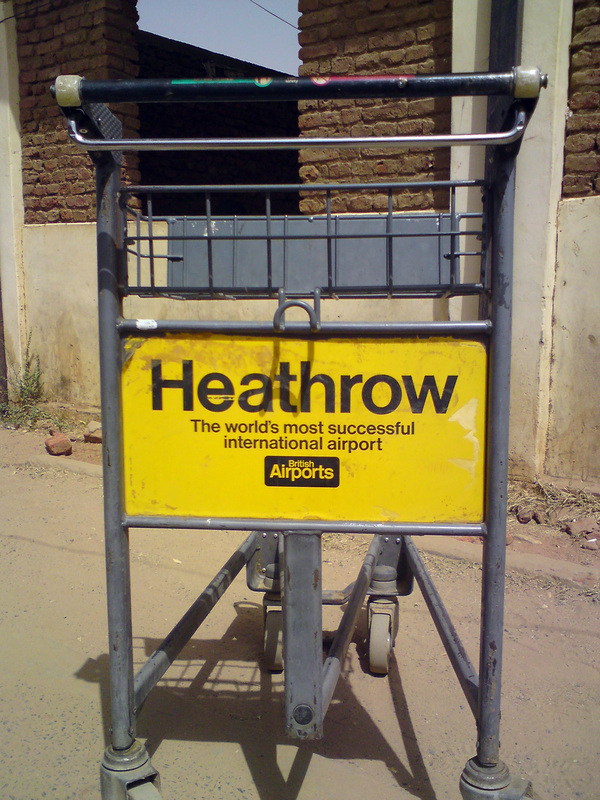 It was easy to be profligate, we weren’t and I take personal pride in having taken the lead on travel budgets and integrating the acquisitions we made. As we grew (acquiring first a US firm, then a German one) and shifted our centre of operations (and development) from Europe to the USA the Executive Management team all recognized the importance of having a set of values and a structure that could transcend global operations while recognizing cultural nuances peculiar to the location of each office. What might go down well as a motivational incentive in Denver would need tweaking to be embraced in Maastricht let alone in Guildford. We needed a framing device that everyone in the business could buy into and in the management’s case the cojones to ‘get with the programme’. So we organised a cross company group of all levels to work through what they wanted out of the business – how they wanted to be treated as employees and in most cases, shareholders. a place that was fun to work where you could pick up the phone to anyone. We had 6 locations and office sizes ranged from 12-50. We had a central sales/CRM system everyone used and we had quarterly conference calls with the management team where people could ask what they wanted. Board meetings rotated around the various offices, one was virtual the next in situ. When tough decisions were required we were clear about why they were being taken and communicated that. Of course technology and process played a role, the corporate intranet was a good information source. We conducted Peer Assists, After Action Reviews; we fed our learnings back into the development process and we used what we learned to reengineer the business around the Stage-Gate New Product Development Process. The going got tough, people got let go, yet Sopheon survived and today has an award winning software, Accolade, with embedded Knowledge deployed in the innovation and new product departments across hundreds of organisations globally. Whether business or sport, people respond to good leaders who provide guidance and clarity, hold people to account for poor performance and recognize/reward exceptional performance. They are also good at making the right decision and leading teams through implementation by inspiration, perspiration and collaboration. I’m sure those will feature prominently when Captain McGinley releases the inevitable ‘Building a winning Ryder Cup Team’, book. Good decisions are informed by good knowledge: of clients, of markets and of resources. Knowledge Management when performed well becomes ingrained behaviour and Knowledge Sharing is a core element. In the old days ‘knowledge is power’ used to mean holding on to it and only giving it out judiciously to certain people. In an Internet world there is no point in having knowledge if people don’t know you have it, and if you are not prepared to share it. Web tools enable more knowledge to flow more readily around your organisation. Taking part in this process is going to be more obviously a part of being more productive than ever before. Being able and willing to share your knowledge will become a key business skill. Collaboration is the mechanism by which Knowledge is often shared. It is something Apple and the US Ryder Cup designate (a forecast from me – Azinger to be the US Captain in 2016) recognise as being a core ingredient for a successful venture. So should you! It was he who encouraged me to blog about my experiences and I have always wanted to be able to share some of the techniques I’ve come to adopt when undertaking international assignments. The offer by Sandra Ward and Val Skelton, Co-Editors of Business Information Review, to write an article for the forthcoming edition was too good to miss and so today I submitted that piece. In today’s global village the ability to work cross border and cross culture is increasingly important. This article looks at the lifecycle of an assignment from winning and negotiating to working and collaborating concluding with reporting and getting paid. It examines what it takes to run successful international assignments while identifying a number of potential pitfalls to be avoided and issues to be considered. I am lucky; I’ve worked across five continents and experienced many different cultures over the last 40 years. I’ve been shot at in Ireland, detained in Sudan, been part of an aid convoy in the Philippines after Typhoon Ondoy, slept in a tin shack in Darfur, shared a room with a desert rat while watching oil fields burning in Saudi Arabia in the aftermath of Desert Storm and landed in Barbados after the island’s only hurricane. When I reflect on a few snippets from a lifetime of conducting international assignments it’s perhaps unsurprising that my daughter frequently asks the question at the top of this piece. We’ve all had ‘we’d like to invite you to tender for’ requests from organizations we’ve never met. As you become more visible and published so these increase. As a rule unless you can trace a direct link to someone you know or somewhere you’ve been then you are being used as padding for a tender process. Be warned. It takes a considerable effort to respond to tender requests especially when there are procurement specialists intermediating…. ….An African friend of mine signed up for a consulting engagement with one of Africa’s major organizations. It looked great and met all of the criteria outlined above. 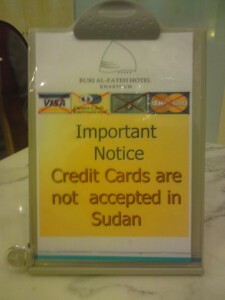 Payment was triggered by receipt and acceptance of a set of reports and recommendations. Now 9 months later he is still waiting for formal approval for his reports. His mistake? He had no milestone payment and no upfront mobilization fee. Next time he might insist on a payment for delivery with balance on acceptance. … Before I decide on whether to go or not to a country I check out what and whom I know who might help – I conduct my own ‘Peer Assist’ – and visit the members’ library at Chatham House. …The Culture Map which notes that human speech varies depending on whether there is a “high” or “low” level of assumed shared cultural context. This affects vocabularies: the English use more words whereas North Europeans (and Americans) tend to be more forthright. Why is this relevant? If you don’t adapt your style and (in my case) speak slower, write more succinctly and with less jargon, there is huge potential for miscommunication…. If the way we speak, write and hold ourselves is important so are the technological underpinnings. Consider this: in many organizations the jump drive (memory stick) is banned. There is a limit on email size (try sending a video to a client), browser activity is monitored and restricted and guest access behind their firewall requires countless sign off and takes days!…. Even the best of us can inadvertently put a metaphorical foot wrong. Our actions are magnified when we are dealing in a different environment and out of our comfort zones…. 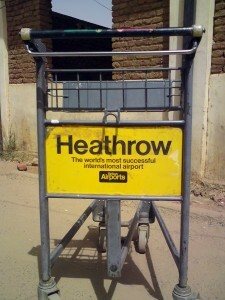 I’ve had mainly positive experiences dealing with international clients and getting paid. Typically the more ‘developed’ the country the worse organizations (especially governments) are at making payment if you are an SME. However I’ve found people will try and find a way to pay you if they feel you’ve done a good job. Your challenge is to manage that perception!….. If I were advising someone about to undertake their first international assignment what would I tell them? Clarity is key, ambiguity is the enemy of progress: be clear about the terms, what they are going to get, when and in what format and what help and assistance you need from them in order to deliver it. Prepare for the unexpected: plan for disasters and have a backup (if you are on medication take that in your briefcase); save your work to the cloud (securely of course). Adopt my 50/50/50 rule and always have that amount of £, € and $ in your wallet. Keep detailed field notes and conduct regular After Action Reviews or Pause & Reflect sessions as a team: It’s vital to be able to reflect on what you’ve heard and to have the ability to play that back in regular progress reports. I will share the rest of the article and the remaining seven tips over the coming months.